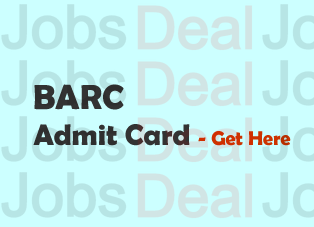 The information in this guide is about BARC Admit Card 2017, BARC Stipendiary Trainee Admit Card, BARC Stipendiary Trainee Exam Date, BARC ST Hall Ticket, Stipendiary Trainee Call Letter for Exam and other beneficial updates. Bhabha Atomic Research Center is thinking to make the BARC Admit Card 2017 visible to its online portal for letting the applied contestants have the access to it. This is going to be done with an intention to give permission to the candidates who had submitted the forms for the post of Stipendiary Trainee, etc., in previous days. After clearing the exam, their recruitment will be considered for the applied post, such as UDC, Technician and others. But, passing and sitting in the test requires you to download BARC Stipendiary Trainee Hall Ticket 2017. To get it from the site, you will have to enter some important information which is unique to you just like any other contestant. As soon as the BARC Scientific Officer Call Letter is out, we’d give you a download link, till then keep visiting our blog. Latest News: The candidates have been granted permission to download their Admit Cards for the screening test of ST (Stipendary Trainee) and UDC (Upper Division Clerk) posts. It further has declared the List of Eligible/Ineligible candidates for the exam (see links). Old News: The link for the download of Admit Card for the post of Stipendiary Trainee (ST) will be avaialbel soon for 99 posts. The download regarding the Advt. No. : 01/2016 (R-I) for the 168 posts is over now. Another download for the advertisement NO. 01/2017 for 99 posts is about to start here. So, keep visiting us (www.jobsdeal.in)! From total 99 posts, the 86 posts are meant for Plant Operator/ Health Physics Assistant (HP), Laboratory Assistant, Fitter, Welder, Turner, Electrician, Instrument Mechanic, Electronic Mechanic, Machinist, and rest 13 posts of Upper Division Clerk (UDC) are available. Contenders will need to be part of every round of the selection process in order for being selected finally – Written Exam (Stage 1), Advanced test (Stage 2) Trade Test (Stage 3). There might also be the conduction of Interview. On being selected for the applied post, you have to perform all duties of that job. That is why it is recommended that you should ensure the nature of duties via the advertisement. At the time of taking the exam, there must not be any disturbance and you need to follow all rules that apply. The admit card, as per latest news, will release shortly and a link for downloading the same will be activated here for you to download it. The exam will be conducted on pre-selected "Exam Date'. The attentive contestants had to satisfy all criteria put by the department as the total number of vacancies available in the department are 168. There are some physical standards that are to be met by the applicants, such as the height of the candidate should be at least 160 cm and weight should be 45.5 kg. The method of selecting the suitable candidates for the post of Stipendiary Trainee (ST), Technician/C (Boiler Operator) is based on Pre Exam, Advances Test, and Skill Test. However, the selection of UDC is based on Written Exam which includes Paper 1 and Paper 2. The test will be held at a large number of exam centres across the country. Also, there will be no travel payment for this. Don’t forget to bring other documents with your apart from carrying BARC Stipendiary Trainee Admit Card 2017 at the moment will partake in Online Exam. For that, you may carry a photocopy and original copy of your identity card to show to the exam invigilator in case they verify. Furthermore, you are advised to report to the centre before enough time so that you could easily do the formalities of the exam and check where your sit is situated. You should not do any mistake or useless activity while entering the exam centre or walking around the premises. If you are wondering why the BARC Call Letter is still not out, don’t stress since the department is currently processing that. The entrance to the exam centre is only open to those applicants who possess their Hall Tickets. There are various reasons why this Hall Ticket is considered one of the important or must-have documents. It contains your unique data which helps you recognise various things and by taking a look at it, the invigilator can also understand that you are an authorised person to be part of the Online Examination. But, do know what would happen if you dare not taking this BARC ST Hall Ticket/ Call Letter 2017 on Exam Date or the day when the exam will be conducted on? You will probably be disqualified. And, who wants to experience that? Well, no one. The information that this Hall Ticket carries may be your Name, DOB, Registration ID, Exam Centre Name, Code, Address, and other vital data. Ignoring this special document will only get you in trouble and don’t even think of doing that, rather you would get a photocopy of it to bring it on the Exam Date. Take your time and consider following the below-described steps to find it easy to download your admit cards. At first, log on to the authorised link of the department, viz. www.barc.gov.in. There, on the latest news section, you will see a link related to the declaration of this “Admit Card”. Clicking on it will open a page of all current Hall Ticket links. But, you have to click on one which relates to “Stipendiary Trainee”. Enter your asked details carefully and submit. Finally, collect your BARC Admit Card 2017 for ST online exam to be conducted in the upcoming days. Also, get photocopies of the same for later use. If you want to ask anything about this, go on telling us via the comments below.